Visit Toys R Us Geoffrey’s Birthday Celebration event for super-fun activities. 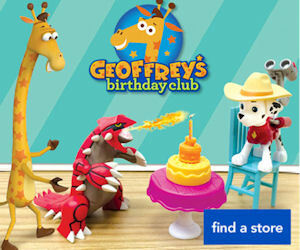 Geoffrey Birthday Club members can get a FREE Geoffrey plush and The Legend of Geoffrey storybook! Join the Geoffrey’s Birthday Club and they’ll email you a coupon a month before the child’s birthday to redeem for your free plush and storybook. The next event date is Saturday, March 4th from 11am-12pm.